The national award includes a medal embossed with the Tiger emblem. At a function held in Kilinochchi Thursday in honor of the grand master, along with Mr. Pirapaharan, the LTTE's political leader Mr. S.P. Thamilchelvan, Special Sea Tiger commander Col. Soosai, deputy political head Mr. S. Thangan, head of the sports division Mr. K. Pappa, head of the Tamil Eelam Karate Association Ratnasothy master, head of the sports coordinating committee Mr. M. Pathmanathan and Sports coorodinator Mr. Inban participated. Grand master Bonnie Roberts was born in Kalmunai in the Batticaloa district. 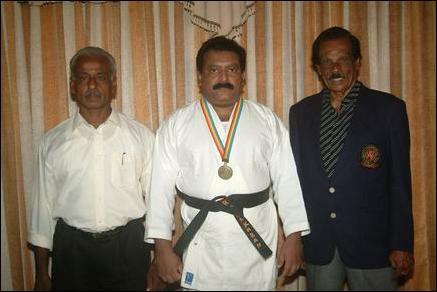 He has the distinction of being the first Tamil to participate in international Karate competitions. 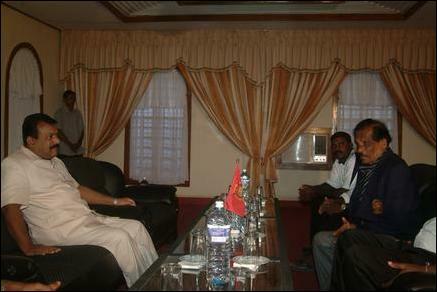 He introduced Karate in Jaffna. He is the only representative of the International Shotokan Karate Association in Ilankai (Sri Lanka) approved by Japan. At the end of the event, Grandmaster Bonnie Roberts commended the LTTE leader for promoting the growth of the art of Karate and honored him by presenting a black belt, the leader’s sixth, the sources said.